There’s not much that can get me out of bed before 6am on a weekend. But in early September, I leapt out of bed before my alarm went off at 5:30. This was going to be the best weekend of the year! I was heading up to the South Fork of the American River to go kayaking with the California Women’s Watersport Collective and 12 other young adult cancer survivors from Northern California, all part of First Descents, an organization providing life-changing outdoor adventures for young adults impacted by cancer. Over the past three years, the Cali Collective and First Descents have become such an important part of my life. Before that, whitewater kayaking had never even been on my radar. But somehow in August 2015, I ended up totally out of my comfort zone, sitting in a kayak on the Clark Fork River in Tarkio, Montana. I had taken a leap of faith and signed up for a week-long First Descents kayaking trip. Five years before, I had been diagnosed with thyroid cancer, and 20 years before that, I had been diagnosed with a life-threatening spinal tumor. When I went through the first rapid, it was the one of the scarier moments of my life (cancer diagnoses and treatment aside), but also one of the most exhilarating! By the end of the first day, I felt so powerful and strong. My body, which had betrayed me in the past, was now paddling through rapids! At the end of the week, not only was I walking away with a love for paddling, I was walking away with a new family—a community of other cancer survivors who all understood what it was like to face illness at a young age and who were reclaiming their lives by choosing adventure. The cast and crew of the FD-Cali Collective weekend. I commented to a kayaking instructor that I would love to continue with the sport but there was no kayaking community for me to connect with back home in San Francisco. She said, “you live in California, don’t you? Look up the California Women’s Watersport Collective.” So I did. I was immediately embraced by this community of women. At first, I was nervous—these were some badass kayakers! And I was a city slicker with only a few days of boating experience under my belt. But participating in Cali Collective’s weekend clinics over the last two years has given me more confidence as a kayaker, and connected me with a whole bunch of awesome female paddlers—another new community that has welcomed me with open arms. 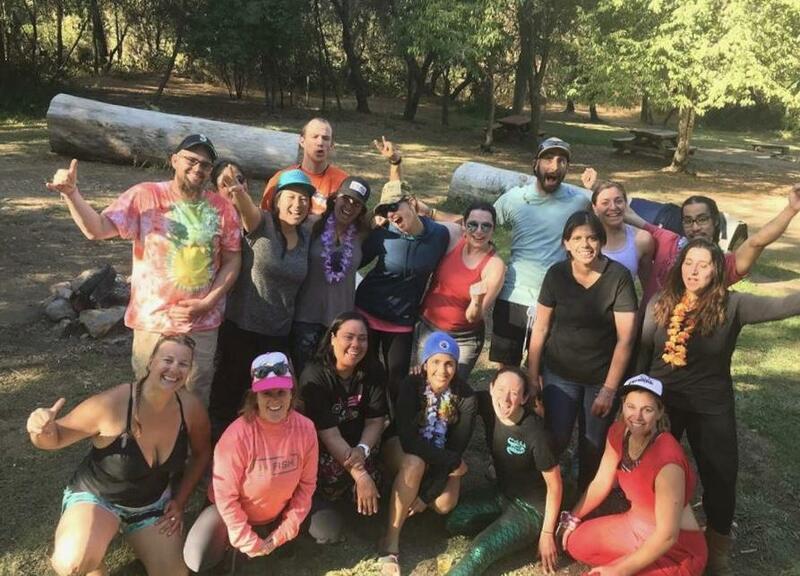 So in September, I was beyond thrilled when Cali Collective partnered with First Descents to offer 13 young cancer survivors from Northern California three days of kayaking, camping, and community on the South Fork of the American River. Like the other Cali Collective weekends I had been a part of, all the amazing elements were in place: top-notch instructors, delicious food, yoga, and a beautiful campground right along the river. But there was also something extra special and magical about this First Descents-Cali Collective clinic. Instead of calling our each other by our real names like Sarah, or Mathew or Phil, we went by our First Descents names--Pamplemousse, Uncle Tie Die, and Bacon. We gave our instructors First Descents names so they wouldn’t feel left out--for instance, Mel, Laura, and Alex became Mama Bear, Tizzle, and Fairy Bear. In between rapids we practiced t-rescues, and rolling, and learned how to surf waves. But we also shared stories of cancer diagnoses, chemo treatments, surgeries, and our hopes and fears for the future. We had dance parties wearing costumes and furry onesies. We sat around the campfire for hours and shared stories about illness and resilience and perseverance and adventure. Over the weekend, I couldn’t help but remember my first time in a kayak three years ago. When I first sat in a kayak, the scariest thing about it was how it was just me in that kayak. I had to paddle, I controlled the direction the boat was going, and I was ultimately responsible for getting myself through the rapids. But at the end of the weekend--as we stood in a circle sharing what we had gained from the weekend and what we would be taking home with us--I realized that kayaking is a team sport. Just like during a cancer diagnosis, when paddling you need to surround yourself with people you trust 100%. People who will cheer you on. People who will come rescue you when you find yourself swimming through a rapid. People who remind you to “look where you want to go.” As we said our goodbyes, I was filled with gratitude for both the Cali Collective and First Descents--not just for teaching me to kayak, or helping me to understand just how strong I am--but for making my heart feel so full from the community I have gained. Author, Linda Shak, aka Punky, lives in the San Fransisco Bay Area and is Out Living It every chance she gets! To learn more about First Descents and their amazing programming, please visit their website. All words and images copyright California Women’s Watersport Collective 2018. All rights reserved.